“. . . office,” I think this was supposed to end. 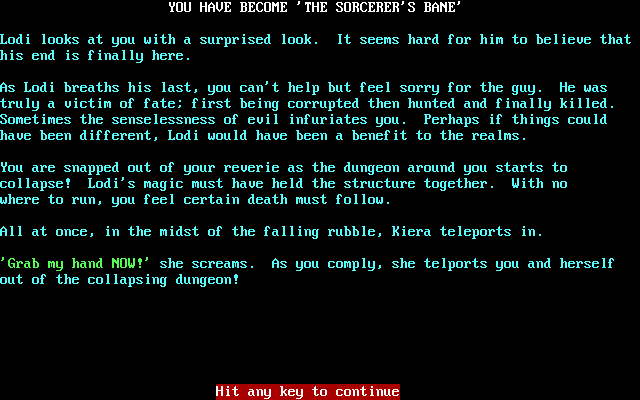 Sorcerer’s Bane is a shareware roguelike. 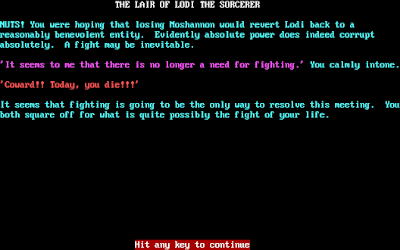 The player controls a fighter, magic-user, or bard who must descend 30 levels of a former magicians’ academy called Mogadore, find four pieces of a slain sorcerer’s staff, and use it to defeat an evil wizard named Lodi. 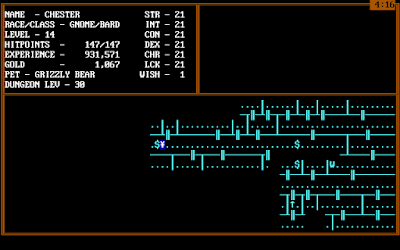 There are some sacrifices in typical roguelike mechanics: encounters pop up randomly; you cannot see monsters on the screen; dungeon levels are very basic; there are no complex interactions among inventory items; and there’s no food system. 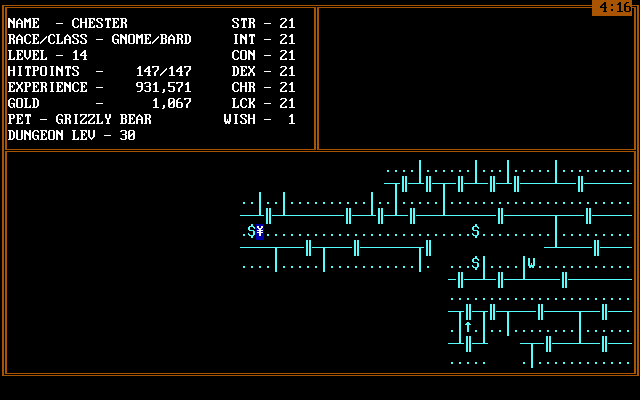 However, these losses are balanced by some interesting encounters, an intuitive interface, an excellent “help” system, innovative ideas in item effects and encounter options, and a more interesting backstory than the typical roguelike. Length and difficulty are both set at optimum levels. The game wrapped up in a satisfying manner. 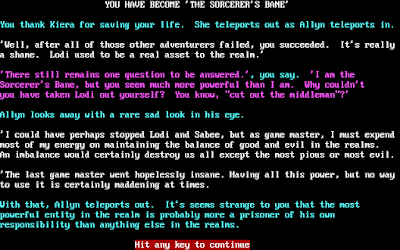 It perhaps lasted a smidgen too long, but the problem was less “real” length than a certain amount of angst after I crossed Level 20 without finding the dragons or the evil necromancer Lodi. I then started to wonder how long the developer was going to stretch things. Fifty levels? A hundred? It turned out that the answer was 30, and if I’d known that at the outset, I probably wouldn’t have minded. 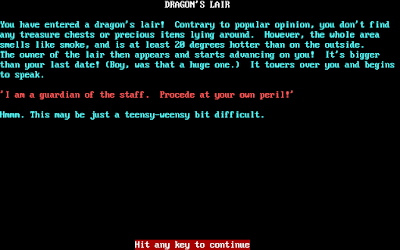 I found all the dragons’ lairs (D) on Level 29. After level 10, you’ve left the town so far behind that you probably won’t go back. It turns out that the game never develops a method for fast travel to the town. Instead, you have to rely on the rare wandering cleric and wandering trader, or–more likely–your growing inventory of wands, rings, and potions. By Level 20, I had found pretty much every item in the game. Rings never run out of magic, so you only need to find one of each. Wands do deplete, so it makes sense to carry as many useful ones as you can. 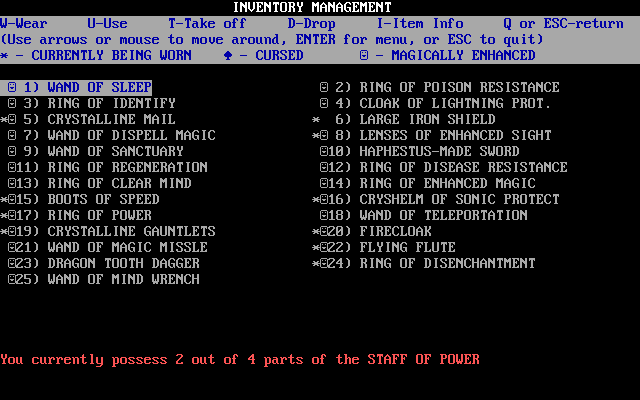 By Level 20, I had also found enough books, potions, and wishes that my attributes were all at the maximum of 21. 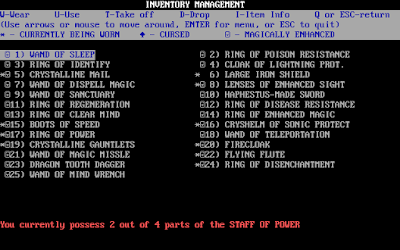 My late-game inventory has just about every type of ring and wand. Enemies get a lot harder as you descend. You meet advanced undead like wraiths, specters, and vampires, different types of elementals, advanced were-creatures, spellcasters, demons, giants, and of course (ultimately) dragons. Most of these creatures have special attacks that can paralyze, poison, disease, damage your inventory, and so forth. Fighting them becomes a game of swapping inventory the moment combat starts. For instance, you want to put on a Ring of Clear Mind the moment you meet a vampire or he’ll charm you and then kill you, but you switch that to a Ring of Disease Resistance if you run into a troll. A fire elemental requires an immediate donning of a Firecloak. A weirdly large number of enemies–including demons and most undead–die immediately if you have a Ring of Disenchantment equipped when you meet them. It’s cool but it seems too easy. 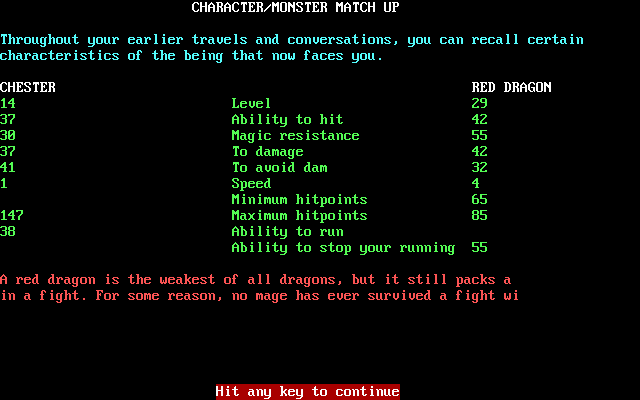 All the swapping gets a little tiresome, and I admit I adopted a policy of fleeing from most encounters with certain enemies (especially disease- and lycanthropy-causing enemies) and saved fighting for the tough brutes with no special abilities, such as giants and ogres. There are a small number of enemies–particularly ghouls, harpies, and thieves–whom it makes no sense to fight at all because they teleport away if you get close to killing them. Harpies not only teleport away before they die; they take your items with them! It took me a while, after my disastrous encounter with a Deck of Many Things, to restore my inventory. In particular, it took a long time to find a magic weapon, and some creatures are only damaged by magic weapons. I finally gave up and used a wish to get one, choosing the “Haphestus-Made Sword” (I think the developer meant “Hephaestus”), which I think is the most powerful weapon in the game except for the “Bazerker Sword,” which comes with the usual curse on that item–that is, you automatically attack everyone, including friendly NPCs. Later, I used another wish on grizzly bear and dream wolf companions, which was pretty cool, but they didn’t last long, and they can only damage creatures that don’t require a magical weapon. My grizzly bear and dream wolf help me against a cockatrice. There are some unfortunate bugs in the game. At least, I think they’re bugs. Basically, some magic items simply stop working even though you still have them equipped. Usually, un-equipping them and re-equipping them solves the problem, but not always. Regeneration was particularly troublesome. I could never get a handle on how to make it work consistently. Whether I was wearing a Ring of Regeneration, wielding my magic flute, and singing the healing song–or only some of these things, or none–sometimes I’d regenerate 10 hit points per round, sometimes one, sometimes none. Sometimes I’d only regenerate outside of combat, and sometimes only in combat. I used these problems as an excuse to not strictly accede to permadeath. 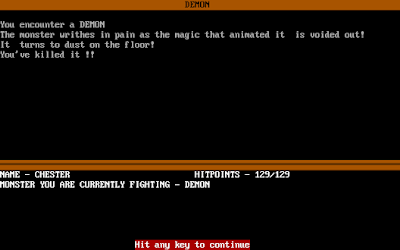 I backed up the game every couple of dungeon levels and restored when I died. I ultimately restored five or six times, but I think except for the last two (when I faced Lodi), I could have prevented the deaths with a little more care. Gotta get what I came for. 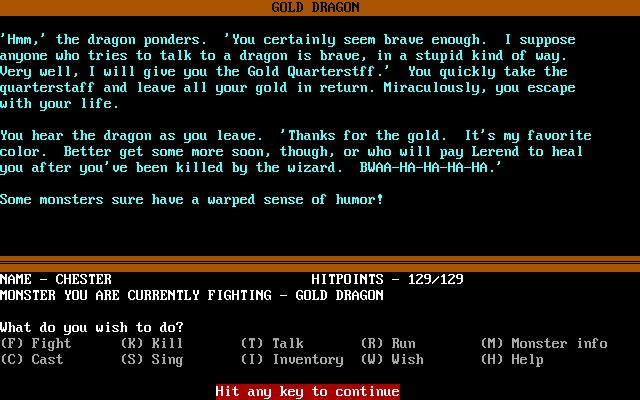 I tried talking to the first dragon I encountered, the gold dragon. He congratulated me for my bravery and gave me his piece of the staff after taking all of my gold (which had utterly lost any other utility by then anyway). An alternate way to solve this part of the quest. The other dragons weren’t as nice, and I had to fight them with the appropriate magic items to protect against their special attacks. 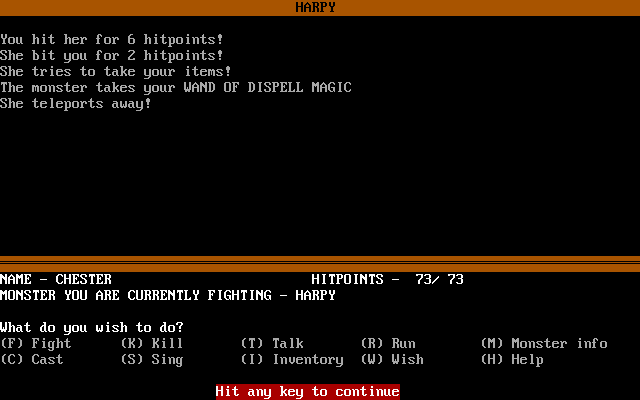 I mostly killed them with Wands of Magic Missile and Fireball, which do about 10 times the damage of my weapon. Red was supposed to be “easiest” (as a unicorn had previously told me), but he was immune to any magic, so in that sense, he was harder. I had to use a wish to restore my hit points after he nearly killed me, finally killing him after a few dozen rounds. The staff filled in the rest of the backstory. 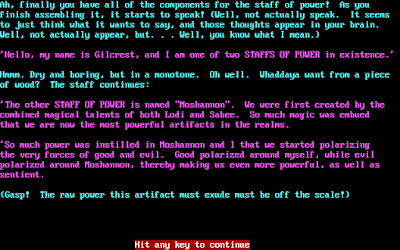 Apparently, when Sabee and Lodi created the Staffs of Power, they made them so powerful that the staffs “started polarizing the very forces of good and evil.” Gilcrest became aspected to good, while his counterpart Moshannon took on an aspect of evil, ultimately corrupting Lodi, its wielder. (Gilcrest and Moshannon are both place names; who knows what they mean to the developer. Come to think of it, so is Lodi.) Gilcrest said that I’d find Lodi on the next level, and that he (Gilcrest) would take care of neutralizing Moshannon. 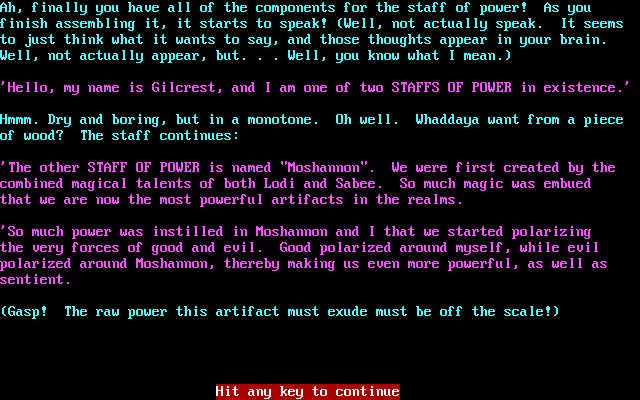 The Staff of Power is chatty. Level 30 was a bit different than the others. Instead of a large open space with a few rooms, it consistent entirely of interlocking rooms. A very different look than the first 29 levels. Still, it wasn’t long before I met Lodi. In a bit of exposition, we both drew out staves, but the staves decided to take their fight elsewhere and disappeared. Lodi, enraged at the loss of his staff, rejected my peace overtures and attacked. Might as well preserve all these text screens for posterity. Like the red dragon, he was immune to magic. He had his own magical attacks and managed to hit me with a melee weapon almost every round. I didn’t last long against him on my first attempt. 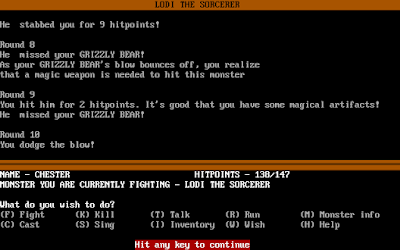 On my second, I used a wish to conjure a grizzly bear companion (leaving me with one more) and equipped a Ring of Disenchantment and a Ring of Regeneration. These things helped. He was unable to hit me with spells, and the grizzly distracted him and took his attacks some of the rounds. The “monster info” dialogue told me that he had 120 hit points, so I kept track of how much damage I was doing round after round. When he got me down to about 20 hit points, I used a wish to restore my hit points and kept fighting. But he still killed me when he had about 30 hit points remaining. With my grizzly bear to take some of the heat, I did better against Lodi. After reloading, I spent about 15 minutes fighting random creatures on the lower levels and opening chests until I ran into a djinn who granted me a third wish. 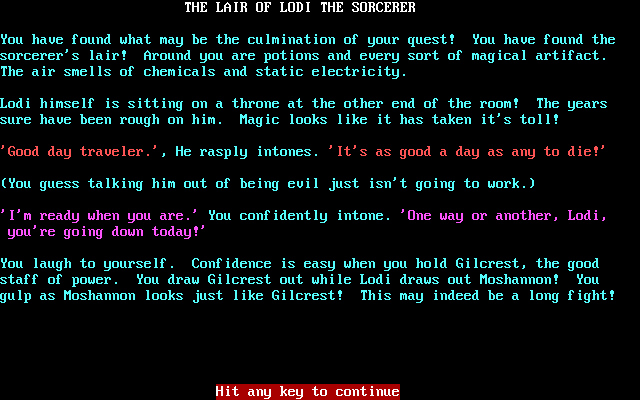 This time, with two wishes in reserve, I was able to defeat Lodi. 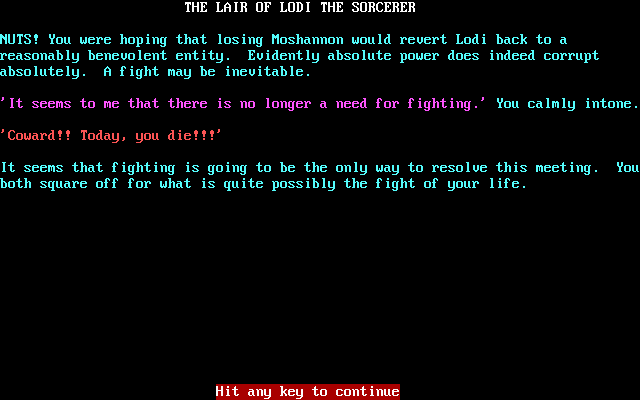 I guess Lodi was a load-bearing boss. 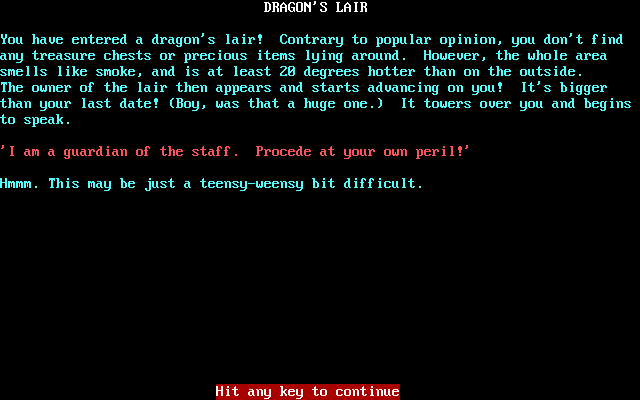 After a final plea to register the game and tells other about it (oddly truncated), I was returned to the DOS prompt. I spent some time with the other character classes, and it’s worth noting that the three classes face very different games. 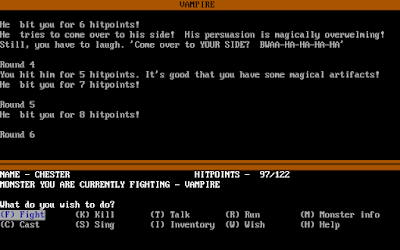 The choice is far more consequential here than in the typical roguelike, where a wizard can essentially become a fighter with the right equipment and attributes. Here, the “hidden” statistics–to hit, to damage, to avoid damage, alertness, and magic resistance among them–are far more dependent on class and level than attributes. A fighter with 18 strength and dexterity hits far more often in combat, and does far more damage, than a bard with the same attributes. I won with a bard, who only ever gets three bard songs, and you almost always want to leave it on the one that heals. 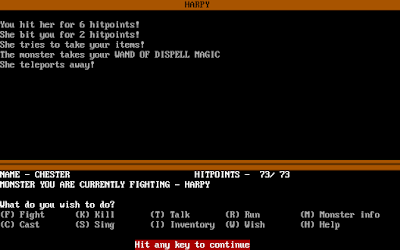 The spells afforded to magic users add a completely different dimension to the game. You seem to get a fixed number of slots per dungeon level, and they reset upon transitioning levels. Unfortunately, there’s no in-game documentation on the spells. I only got to see a couple of levels’ worth. If anyone wants to try this game as a magic-user, I’d be interested in what some of the upper-level spells do and how your experience differs from mine as a bard. 3 points for the game world. 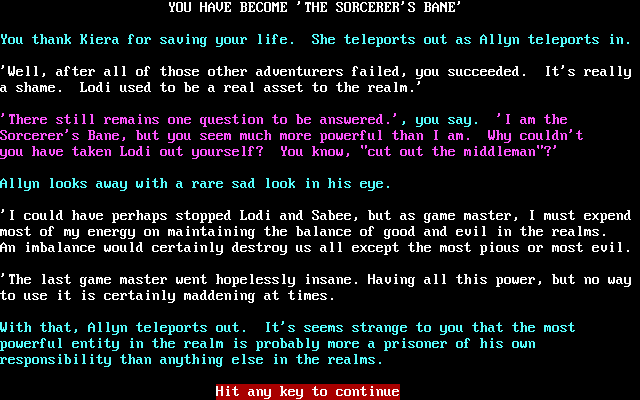 It’s not an epic backstory, but it’s better than the typical roguelike offers (at least, to this point). 4 points for character creation and development. I really like how the choice of class matters. For 2/3 of the game, character development is steady and rewarding, both in the improvement of statistics and the leveling of the character. 3 points for NPC interaction. 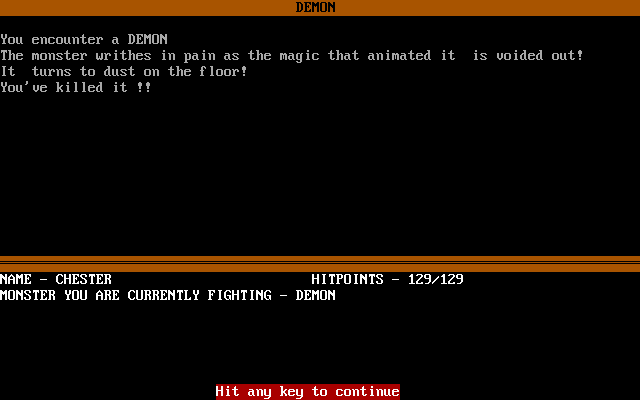 That’s also a relatively high score for a roguelike. Some monsters are effectively “NPCs” and give you hints if you talk with them, and there are more explicit NPCs roaming the dungeon as healers, traders, and gamblers. The gambler with the Deck of Many Things is a particularly fun addition. A creature gives me a hint. 5 points for encounters and foes. 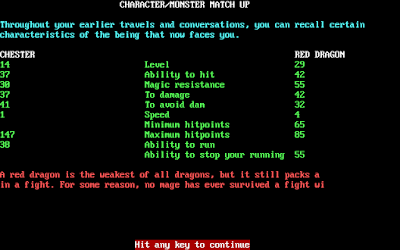 The monsters are fantasy boilerplate, but the developer did a superb job programming in the various special abilities and resistances and then offering them to the player in the “monster info” screen. 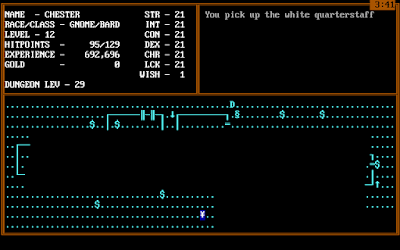 Other encounters, as documented, are fun and unusual for a roguelike. The game’s assessment of the red dragon. 4 points for magic and combat. That’s a compromise between what I imagine I’d give it as magic user (5) and what I experienced as a bard (3). 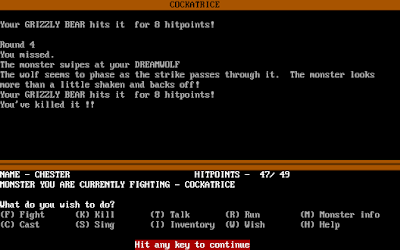 You don’t have quite the same number of tactics as the typical roguelike, and success mostly comes down to equipping the right stuff to counter the enemy’s special attacks. I trade blows with a vampire, with my Ring of Clear Mind protecting me from his attempts to charm. 5 points for equipment. Great variety, easy to assess. 2 points for the economy. It’s useful at the outset, but gold becomes superfluous very fast. It would have been nice if the wandering trader had sold magic items. 2 points for a main quest with no choices or branches. 4 points for graphics, sound, and interface. 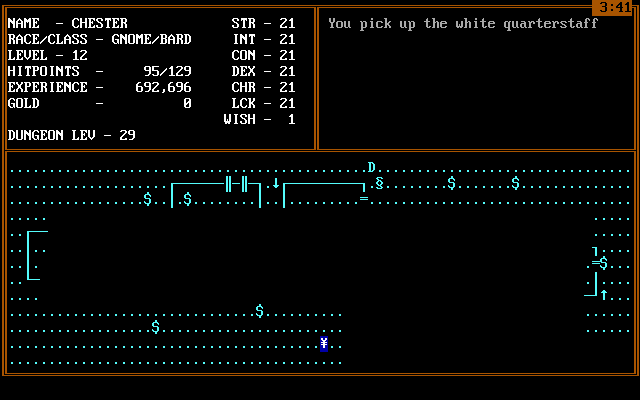 The graphics are sparse, as is typical for a roguelike, and the only sound (aside from error beeps) is a relentless blooping riff on Beethoven that you’ll want to turn off immediately. The interface is superb, brilliantly anticipating all of the ways that a player might want to interact with the controls. Most commercial developers could learn something from this kid. 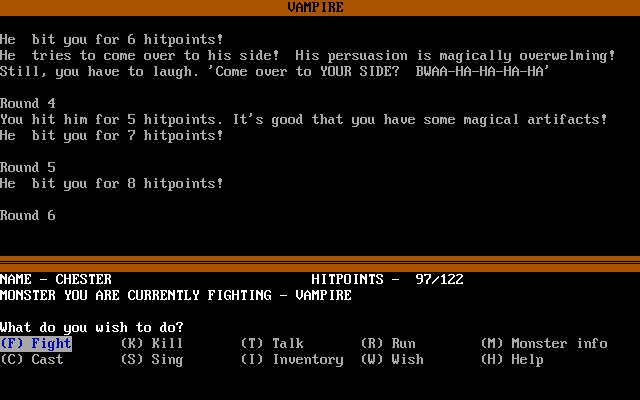 5 points for gameplay, doing well in replayability (with the different classes), length, and difficulty. 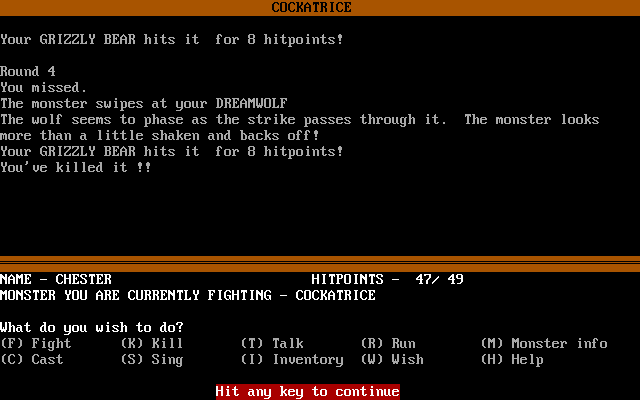 That gives us a final score of 37, a decent figure for a shareware title. Even though it lacks many roguelike elements, I enjoyed it more than the typical roguelike. In the first entry, I said I thought I had found the right Chuck Wood, and that he would have been 18 when the game was published. After some additional research, I believe I’m wrong and that the correct Mr. Wood was closer to 28. From what I can tell, he remained in the software business (at least part-time) but doesn’t seem to have worked on any other games. I send an e-mail to some possible candidates but haven’t received any responses yet. Chuck, if you find your way here, I owe you $19.95.